The Education Department respond to requests for information from the Makah community and the general public and develops Makah Tribal education programs for community members and visitors. Special arrangements can be made for tours, demonstrations, lectures and workshops. All events are provided by Makahs. Guided Tour Cost: $70.00 unless otherwise noted. Group size: 15-24 people. More than 24 people will require special arrangements. Please make arrangements with the Educational Coordinator, Theresa Parker at 360-645-2711, two weeks in advance. 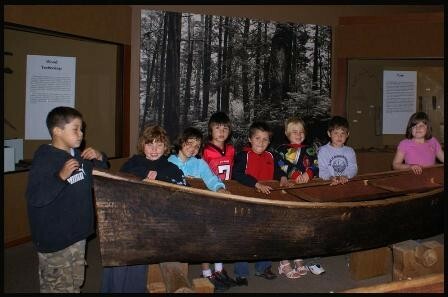 Patty Butler's 1st grade class from Neah Bay School visits the Makah Museum for a day of culture and history.L to R: Derek Gonzoles, Cheyanna Svec, Natane Dawson, Isaiah Knaus, Brennon Greene, Tazara Wachendorf, Ben Greene, and Faith Shaw.